"My psychology tutors were great. Glyn Pickering was such a good teacher and I completely fell in love with the subject because of the way it was taught. At Derby College the tutors put us first." Psychology technician and PhD student Heather Shaw hadn’t expected psychology to be her future career. But, thanks to her positive experience of studying psychology at A level at Derby College, she has found her perfect profession. 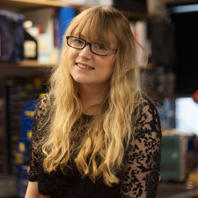 Heather, who is 24 and from Derby, had always imagined she’d work in the creative sector so picked Photography and Textiles A levels. She only chose Psychology as she thought it sounded interesting. But Heather quickly discovered a natural talent for the subject, achieving an A grade at A level then going on to graduate with a First Class Honours degree at the University of Lincoln. She is now studying for a PhD part-time at the university while at the same time working as a technician in the university’s psychology department. Once she has completed her postgraduate studies, she plans to get a research job or go into lecturing.